Belron® is the world’s largest vehicle glass repair and replacement (VGRR) company, generating revenues of over €3 billion in 2015. Their vision is to be the world’s ’natural choice’ for vehicle glass repair and replacement and they have operations in more than 30 countries across five continents, including brands such as Autoglass in the UK, Carglass in Europe and Safelite in the US. Belron is now taking a strategic approach to their Corporate Social Responsibility (CSR) program using EcoVadis scorecards as a common standard to assess performance, set Group-wide standards and goals, and share best practice across operating entities. By doing this, Belron can drive CSR improvements and leverage results in their operational and commercial efforts. Belron has always had a strong ethical foundation that has come from the family roots of the business (the grandson of the founder is the current CEO). In 2010 Belron signed up to the 10 principles of the United Nations Global Compact and these were incorporated into the Belron Way of Working, which forms part of what they call the ‘Spirit of Belron’. Belron received their first EcoVadis scorecards in 2009 through an insurance client, Axa, who requested they complete the EcoVadis assessment in their local operating companies, including Autoglass in the UK and Carglass in France, Belgium, Portugal, Spain and Germany. From there, they have expanded use across the group as a common standard of performance. This process continued for several years: as clients in each region would request CSR assessments or information from various operating companies, each operating company then completed its own EcoVadis assessment and received a scorecard. The missing element was how to assess how well the business units were performing against Belron CSR performance in general and their CSR goals, and how to respond to the increasing demands from key customers to demonstrate their commitment in this area. In 2012, Justin Bazalgette, Head of Environmental Efficiency, was involved in completing the EcoVadis assessment for Belron itself, and saw an opportunity to develop a more strategic approach to CSR. This would not only deliver more consistency around client requests Group-wide, but also eventually make CSR a competitive advantage and help drive improvement. 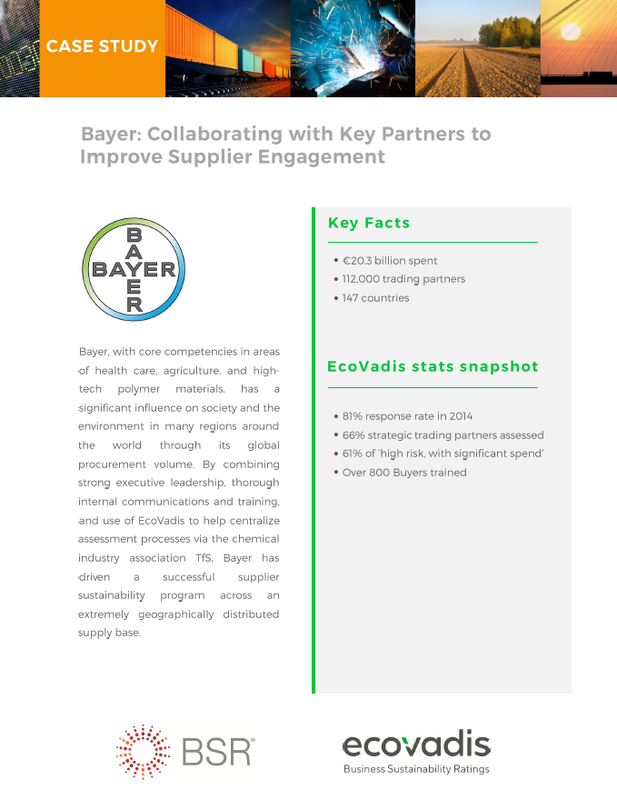 He began developing a strategy for how to leverage the EcoVadis scorecard as the common standard across the Belron group of companies. 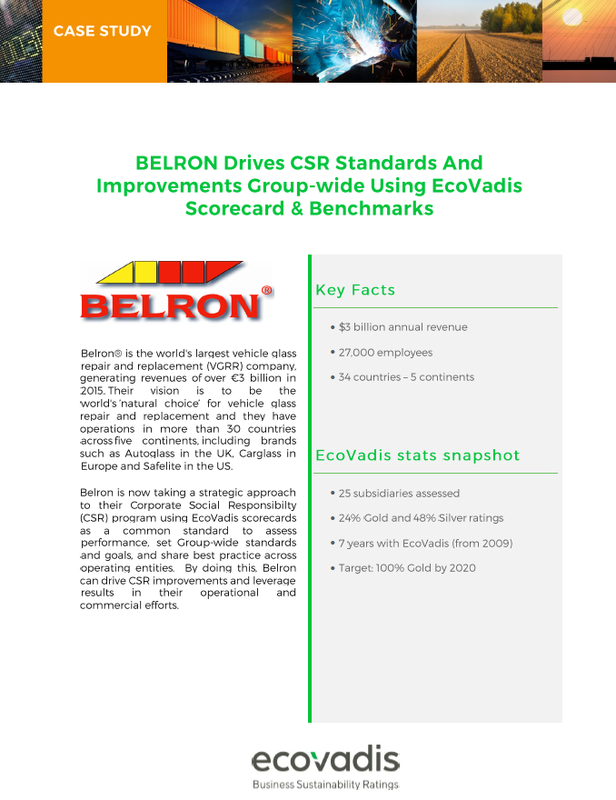 A key attraction for Belron to use the EcoVadis scorecard is the fact that it contains expert analysis from an independent third party, has benchmarks for comparing performance fairly across the Group, and is based on the same principles that are enshrined in the UNGC.